Finished postcard measures 4.25" x 5.5"
Finished postcard measures 5.5" x 8.5"
$1.00 for Full Color on both sides, printed on 100# white paper, mailed Standard Mail. Postcards are a quick easy way to get your message out. Our postcard making tools allow you to accomplish your task at faster speeds. 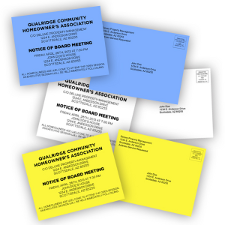 Our Express postcards are great for sending meeting notices, changes of meeting time or location, last minute specials or anything else that contains a short, yet important message. 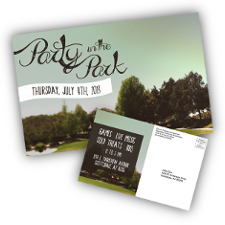 Our PRO postcards, with three times the messaging area as our Express Postcard, are great for richer marketing messages or personalized images. These postcards are BIG and impactful.